March 26, 2018 at 7:36 pm. The Los Angeles Rams made another major offseason move on Monday when they announced they reached agreement with three-time All-Pro defensive tackle Ndamukong Suh on a one-year contract. Terms of the agreement were not disclosed, but ESPN’s Adam Schefter reported the deal is worth $14 million. Suh made his decision after visiting with the New Orleans Saints and Tennessee Titans last week before visiting Los Angeles on Monday. The New York Jets made a subsequent offer to Suh, but they pulled their one-year contract offer after a deadline for an agreement passed. Suh, 31, joins a Rams defensive line that includes defensive tackle Aaron Donald, the 2017 Defensive Player of the Year. The Rams’ secondary was strengthened by the addition of cornerbacks Marcus Peters and Aqib Talib. 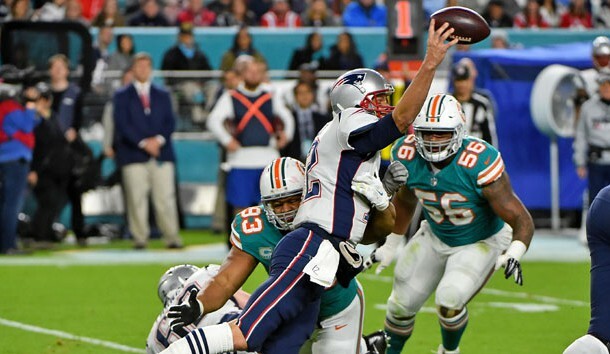 Suh, a five-time Pro Brown selection, was released by the Miami Dolphins last week with three years left on a six-year, $114 million contract signed in 2015. –The New York Giants and wide receiver Odell Beckham could be headed to a standoff. Beckham, in the fifth and final year of his rookie contract, “will not set foot on a field without a new contract,” according to a report from NFL Network’s Ian Rapoport on Monday morning. –Defensive end Chris Long is returning to the Philadelphia Eagles after spending part of the offseason contemplating retirement. At the NFL’s owners meeting in Orlando, Fla. Philadelphia GM Howie Roseman confirmed Long’s return for the 2018 season. Last week the Philadelphia Inquirer reported Long signed a new deal that guarantees him $3 million. –Dallas Cowboys wide receiver Terrance Williams suffered a broken foot, according to multiple media outlets on Monday, and he could miss a portion of offseason activities next month. Cowboys executive vice president Stephen Jones told reporters at the owner’s meetings in Orlando, Fla., that Williams was injured but did not disclose the nature of the injury. According to the Dallas Morning News, Williams underwent surgery four weeks ago. –The Cowboys added three offensive linemen when they announced the signing of free-agent tackle Cameron Fleming and interior lineman Marcus Martin along with the re-signing of interior lineman Joe Looney to a two-year contract. Fleming, who signed a one-year deal with Dallas, spent the past four seasons with the Patriots, and he started 20 of his 47 games in New England. –Christian Kirk won’t be the only hotly debated skill-position star drawing NFL scouts to Texas A&M Tuesday. Throwing the ball to the 5-foot-10, 201-pound Kirk, who is currently ranked third on NFLDraftScout.com’s receiver rankings, will be former Aggies Heisman Trophy winner and Cleveland Browns 2014 first-round pick Johnny Manziel, according to Bruce Feldman of Fox Sports. Manziel, 25, is attempting to resurrect his NFL career after a series of off-field transgressions led him to being released from Cleveland two years ago. The Texas A&M workout is expected to draw representatives from all 32 teams with plenty of decision-makers on hand. –The New York Jets are expected to hold a private workout with Wyoming quarterback Josh Allen next week. On Monday, Jets general manager Mike Maccagnan told reporters at the NFL owner’s meetings in Orlando, Fla., that the team will bring in Allen, who is the third-ranked quarterback prospect on NFLdraftscout.com behind USC’s Sam Darnold and UCLA’s Josh Rosen. –Philadelphia Eagles All-Pro defensive end Michael Bennett has turned himself in to authorities in Houston after being charged that he injured a paraplegic woman as he tried to get onto the field after last year’s Super Bowl. Bennett made a brief court appearance Monday, and the judge set his bond at $10,000 on a felony count of injury to the elderly. Bennett was expected to post bail and be released. Prosecutors allege that when Bennett tried to get onto the field for the post-game celebration he forced his way through security and pushed a 66-year-old woman in a wheelchair who was a stadium employee. –The Tampa Bay Buccaneers re-signed offensive lineman Adam Gettis to a one-year contract, the team announced. Gettis, who is primarily a guard, signed with Tampa Bay in December 2017, but did not play in the two games he was on the roster. He became a free agent in the offseason before rejoining the Bucs. –Jordy Nelson confirmed during a radio interview that he considered taking a significant pay cut to remain with the Green Bay Packers. During an appearance on the “Wilde & Tausch Show” on ESPN Milwaukee radio, he considered the reduction in salary until he met with Green Bay general manager Brian Gutekunst. –Andrew Luck is still rehabbing his surgically repaired right shoulder, but Indianapolis Colts owner Jim Irsay said the quarterback is progressing well. “All indicators are (the) healing is going really well, and we feel really optimistic that he’s turned the corner and has a full decade ahead of him of excellence,” Irsay told reporters at the NFL’s Owner’s meetings in Orlando, Fla.
Luck did not play last season after undergoing surgery on the shoulder on Jan. 15, 2017. –The Carolina Panthers re-signed guard Amini Silatolu to a one-year contract, the team announced. Silatolu was an unrestricted free agent and is entering his sixth season with the Panthers, who made him their second-round pick in 2012. The Panthers also plan to pick up the fifth-year option for 2019 on the contract of linebacker Shaq Thompson, the Charlotte Observer reported. The Panthers also re-signed free agent cornerback LaDarius Gunter, the team announced. Gunter became a restricted free agent when the Panthers did not initially tender him a contract. He is returning on a one-year deal. –A month after being released by the Chicago Bears, free agent linebacker Pernell McPhee signed with the Washington Redskins, the team announced. McPhee is joining the Redskins after spending the previous three seasons with the Chicago Bears. –The New York Giants announced the signing of safety Michael Thomas. Terms of the deal were not disclosed but ESPN reported Thomas agreed to a two-year deal. Thomas spent the previous five seasons with the Miami Dolphins and is the seventh defensive player to join the Giants in a trade or via free agency this offseason. –Linebacker Jonathan Freeny, an unrestricted free agent, has signed with the Detroit Lions, the team announced. Freeny, 28, played for three teams last season — the New England Patriots, Baltimore Ravens and New Orleans Saints, where he made two tackles in two games to finish his season. –The New England Patriots have re-signed offensive tackle LaAdrian Waddle, the team announced. Terms of the contract were not announced, but multiple media outlets reported it was a one-year deal. Waddle has been primarily a backup in his 2 1/2 seasons with New England.